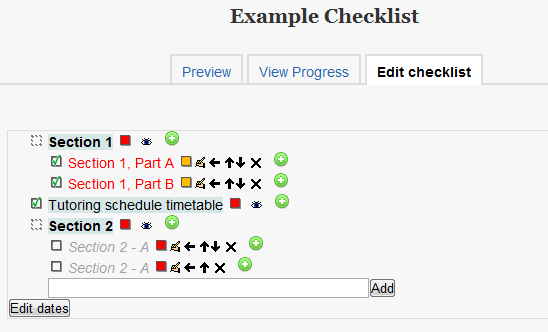 This is my third simple review of a Moodle 2.0 plugin, and the plugin for today is the Checklist module. This is a block and activity module which has been written by Davo Smith from the UK. In Moodle 1.9 there were a few plugins which provided some type of tracking of activities. Some were deep core changes and some were simple blocks, this plugin however combines a lot of features from other modules into a comprehensive feature building on Moodle 2.0 features. This module enables the teacher/trainer to monitor and track the students progress as they tick off the different items on the list. The teacher creates the todo list and the students can tick the items as complete. Not only can the teacher add items to the list for the course as a whole, but also the student can add private items to the list as well. This is one aspect that I like of the plugin. The file that is linked to is hosted on github site. So you can download the zip file and/or browse the source code as the module is within contributed code area of the Moodle Community site. The zip holds 2 parts of the plugin, the activity and the block. Once you unzip, you need to upload the mod/checklist subfolder into your Moodle 2.0 mod folder and the blocks/checklist into the blocks folder on the Moodle 2.0 site. When upgrading through the notifications page, it both installed without issue. There did not seem to be any global settings for the plugin, and the Moodle Docs do not mention anything about it (they are not updated since 1.9). The block/activity does not need any core changes, as they run off the cron. However, there are optional core changes which makes this update immediate. Personally, I prefer to not do core changes as it make upgrades more difficult and costly, so I didn’t do these changes. The document is for Moodle 1.9, however seems to work quite well for Moodle 2.0 as well. There is also a video of how you can use the checklist available on Youtube. This is a nice touch and really helps understand what to do! Adding it the the course prompts you for quite a few settings, so you need to read up on these before hand. Some of the settings are quite nice including “Show course modules in checklist” which automatically adds the list of all the resources and activities in the current course into the checklist. 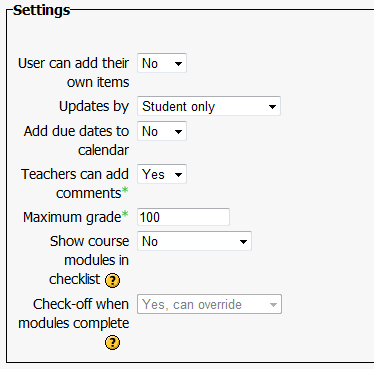 These can be automatically checked off using the completion tracking in Moodle 2.0 as well. The below screen shows the Edit Checklist page, which allows you to add, edit, layout and set whether the checklist items are to be required or not – greyed out is not-required. When adding the block, you need to set which checklist activity it represents, but this is a simple step. The student can easy tick off compete any of the teacher set list entries, or create his own entries too. Each entry can also have a description to explain the context. The block when added to the course provides and in-course visual cue of the completion of the checklist. This reminds me of the progress bar which I have used before. In a word, yes. This block/activity bring the completion tracking of Moodle 2.0 to life. The extra learning objectives or activities can be nicely used to track “real life” events such as research as reading a book, watching videos or practical tasks which are not grade-able necessarily. It can also be used for chalking off soft milestones within the course. Stars: 4 out of 5 stars for this block. I’ve tweaked the documentation slightly, but, as noted, there is very little difference between the Moodle 1.9 and Moodle 2.0 versions. I’ve added in a description of some of the features that weren’t there when I last updated the documentation.